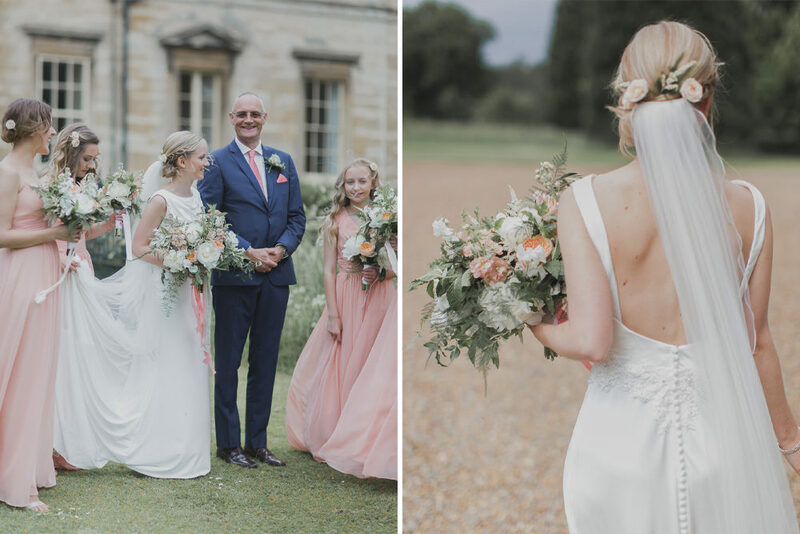 The gorgeous Courteenhall Estate in Northamptonshire where this wonderful outdoor ceremony and marquee reception took please is full of history and magic and made a dreamy location for a perfect peach wedding. 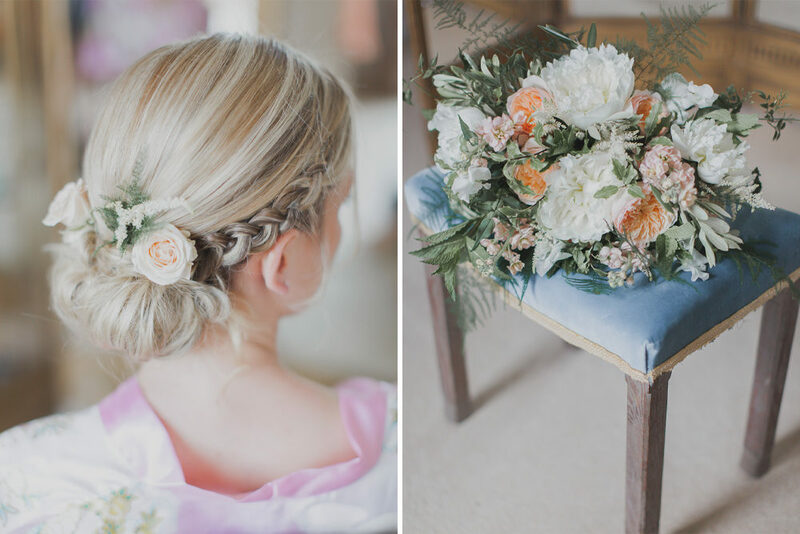 Everything was carefully thought out and put together in a romantic, soft, yet elegant style by bride Melanie who is a wedding planner, and will have you reaching for your pin button before you can say I do! Groom James and Melanie wrote their own vows, gave speeches that made each other and their guests weep, and the lovely Ferri Photography was on hand to capture all the emotion and pretty in her wonderful fine art photography style. Dr Johnny Wake : My family have been at Courteenhall since 1672, and built the Hall in 1789. It’s always been in the family and so has a rich historical feel. The arboretum is a particularly special place: my grandfather (now aged 100!) is a huge tree enthusiast and planted it from scratch. He laid it out with a vision of colours and corridors which is amazing for him to be able to appreciate in its maturity now. We have had various stunning ceremonies in it in different locations, including a Pagan stone circle ceremony. When Anna, my wife and I were deciding where to get married, it seemed crazy to choose somewhere that wasn’t Courteenhall. We couldn’t think of anywhere more beautiful and perfect, and, of course, we planned to spend many happy decades ourselves there in the future; (at the time we were living and working as junior doctors in Oxford). When we moved in we wanted to be able to share the amazing time we’d had with other people. We didn’t want to turn into a wedding conveyor belt. By limiting our numbers we get to really enjoy hosting them rather than them feeling like a burden; we get to know the couples well and they really enjoy the exclusivity, the ability to come in days before to decorate, and the flexibility we have. Melanie the Bride : James and I met at a works Christmas party. We couldn’t take our eyes off each other all night. When he approached me in the car park the following week and asked me on a date, my legs turned to jelly and my heart skipped a beat. Completely unexpected when we were on holiday in Las Vegas, James got down on one knee and proposed while we were in gondola in the Venetian hotel. In between tears and saying ‘yes’, James almost tipped the boat over as he stood up shouting ‘She said yes, she said yes’ much to my embarrassment! 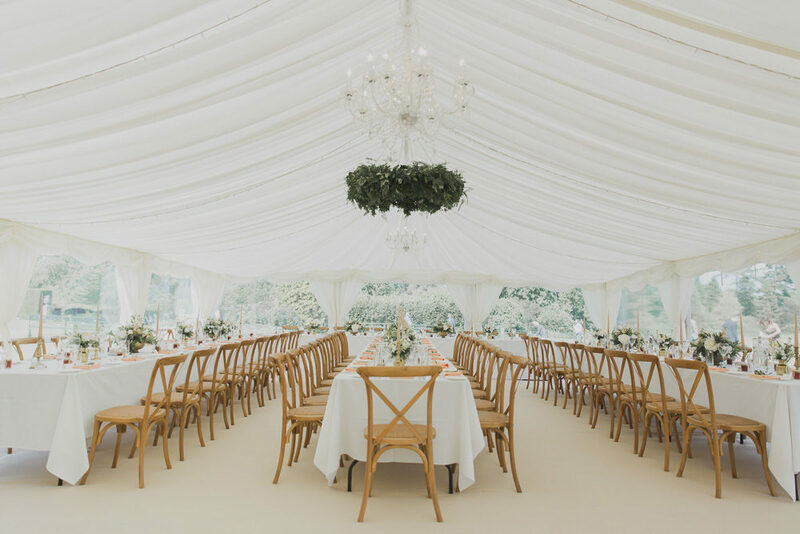 I loved the idea of an outdoor wedding (originally wanting to get married abroad) so a venue with beautiful outdoor space and a marquee was top of the list. Courteenhall House is beautiful private estate in Northamptonshire that only do 8 weddings a year, so we both really liked the idea that not many people we know had been there or even heard of it. The Arboretum provided us with the perfect space for our ceremony; it had a real peaceful and calm feel to it. We wanted to have a really personal ceremony that was about us as a couple. We opted for a humanist ceremony to give us the flexibility to do that. We had a fantastic celebrant who spent time getting to know us. She helped us write our own vows which brought James and I even closer in the run up to the big day. It was a very special process to us both as it meant the words where unique and personal. We had 2 readings ‘The art of marriage’ and ‘love is…’ which fitted in perfectly as it goes on to talk about trees and roots entwined. As we were standing under a big tree for the ceremony that acted as an intermit canopy, the words from the reading seemed perfect for the occasion. Another personal touch was having the celebrant read out marriage advice from both our mothers. We wanted a soft and romantic palette to run through our decor. James didn’t want anything pink so we settled for a pastel peach theme. Only later did we realise that both our mums had similar colour schemes for their weddings; it made it all the more special. I wanted lots of greenery and foliage in our floral design to complement the beautiful grounds the Estate has to offer. 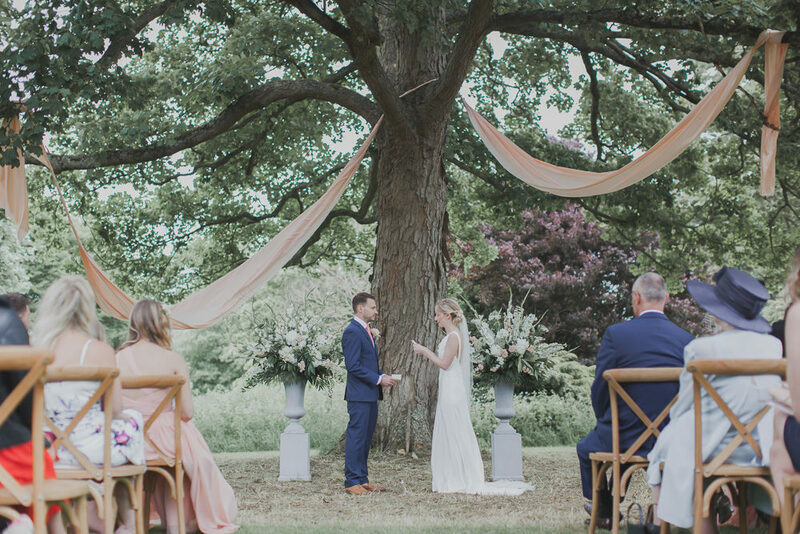 We also wanted to add a large silk ribbon to the tree for the ceremony that would blow in the wind and highlight the grand tree we got married under. We fell in love with the wooden cross back chairs. They were perfect for an outdoor wedding and again fitted with the natural elements in the Arboretum. My wedding bouquet was made up of white peonies, David Austin rose Juliet, Astilbe, Apricot stocks, fresh mint, olive leaf, Sweet Peas, Jasmine and Asparagus Grass. I wanted something natural, free flowing in a soft romantic style. Being the perfect time for peonies I knew I would be able to get the delicate blousy feel. Sarah at Sarah Harper Flowers was absolutely amazing. I couldn’t believe my luck when I found her. She listened to all my requirements and created the perfect arrangement for me. Everything was even better than I could have imagined. Scent was important to me as I wanted to carry on with the outdoor, romantic theme. All the flowers she chose gave off a heavenly aroma, including fresh mint not only for its gorgeous scent, but also for its lush green tones and its natural way of falling; paired up beautifully with the soft jasmine and dainty asparagus grass, it was perfect. Everything smelt and looked amazing. We kept the structure loose and natural. For the bouquets final touches, Sarah used Kate Cullen’s gorgeous silks to compliment the shape and style. We wanted the wedding to have the same look and feel throughout, so the centrepieces were similar to the bouquets; again focusing on scent and elegantly understated. 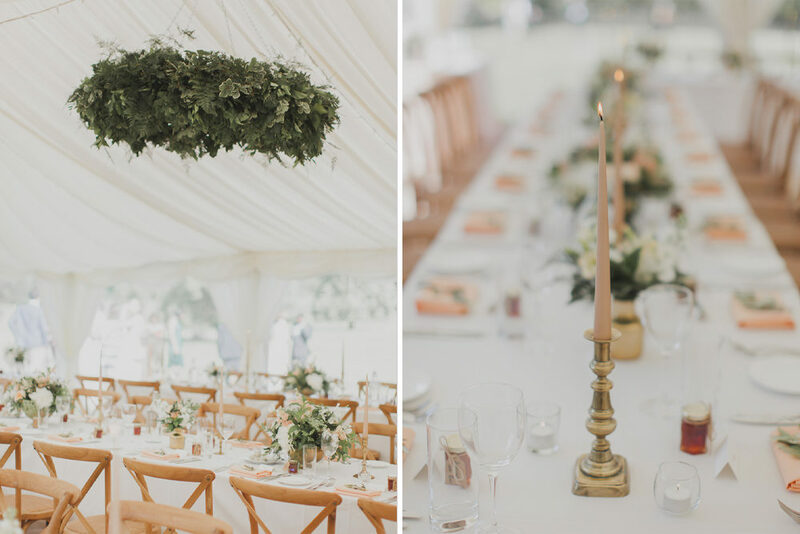 We used olive branches, and peach cotton napkins on the place settings and gold urns and candles holders with tall peach candle sticks to add some extra colour and style to the ivory table linen. I have quite a simple style so wanted a wedding gown that was elegantly understated. I loved my dress from Justin Alexander Dress from Sweetheart Gowns. Their designs are soft and romantic which fitted in perfectly with the venue. The back of the dress was a deal breaker for me and offered a real feature to the dress. My engagement ring is rose gold so my mum gave me rose gold diamond stud earrings to match. On the morning of the wedding James left me a present open which was bracelet to match the ring and earrings. I was thoroughly spoilt! James wore a fitted, two piece navy suit from Moss Boss. It complimented our colour theme and was a real flattering style on him. He looked amazing! The bridesmaids were in peach. All my bridesmaids were of different ages and I wanted them all to be totally comfortable with what they wearing. I was happy for them to have different styles that suited them as individuals. While the best men and ushers wore smart navy suits to match James. Our little 2 year old flower girl (my niece) wore a cute ivory dress from John Lewis. We did hope for her to have floral crown too but unfortunately she wasn’t feeling well and didn’t want to wear it on the day. 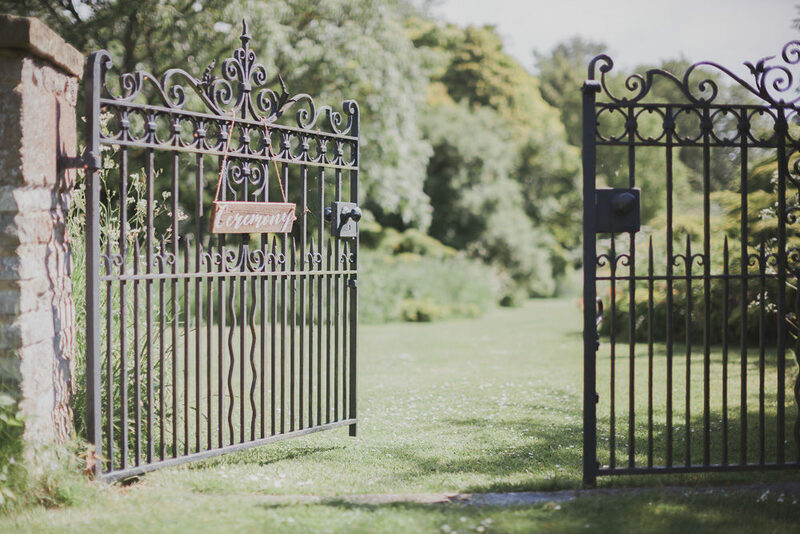 We wanted to take advantage of the views over the lush green parkland so put some outdoor games including croquet on the lawn for guests to play. We also choose to have a live band as we felt bands are best for starting the party atmosphere and getting everyone dancing. During the cocktail hour they played in the Estates grounds. They set up in front of the large, feature pond and water fountain. We were so happy with our band choice; they were brilliant and many guests said how great they were too! 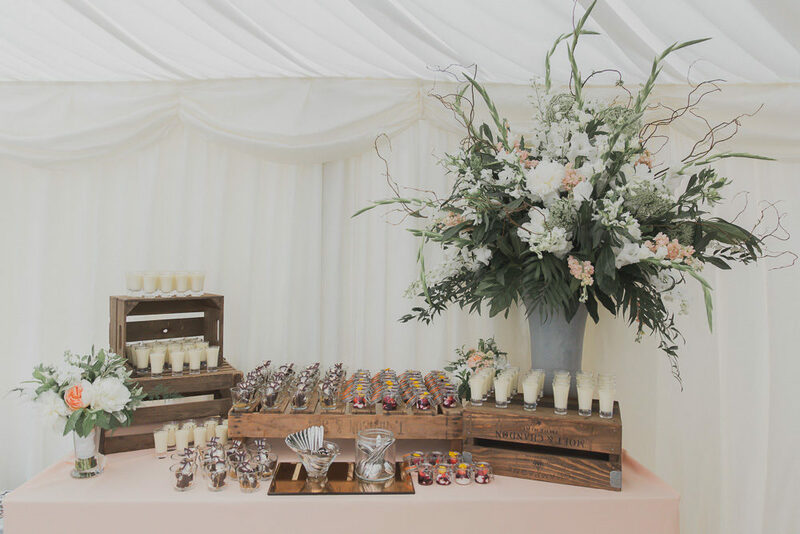 We choose to have a two course seated meal for our wedding breakfast followed by a dessert station with a variety of sweet treats and options by Lemon Zest for people to choose from. We felt this added a bit of fun to the dinner. We had a semi naked cake with three tiers each in different flavours; lemon, vanilla and white chocolate. It tasted as good as it looked! 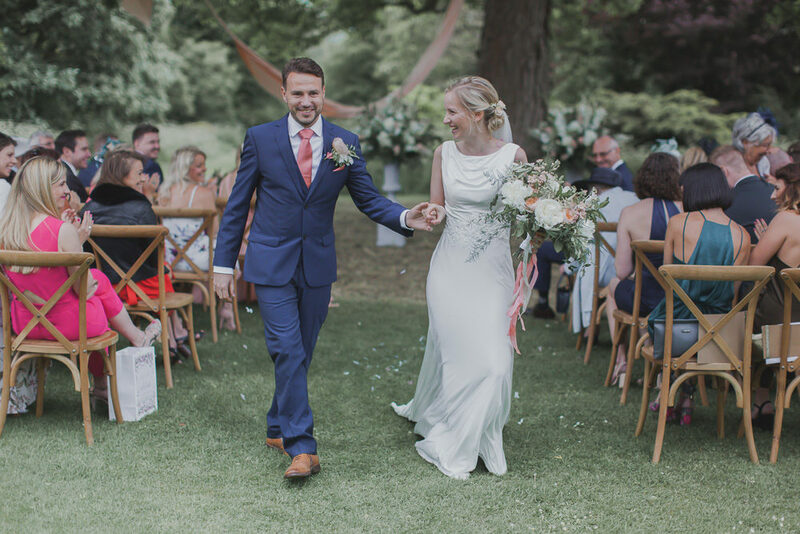 We prefer natural photographs, where spontaneous, candid moments are captured that show how much fun everyone had on the day. It was also important to have a fine art feel to the photos. Ferri Photography‘s style was able to offer both. She was very unobtrusive and captured the day perfectly. 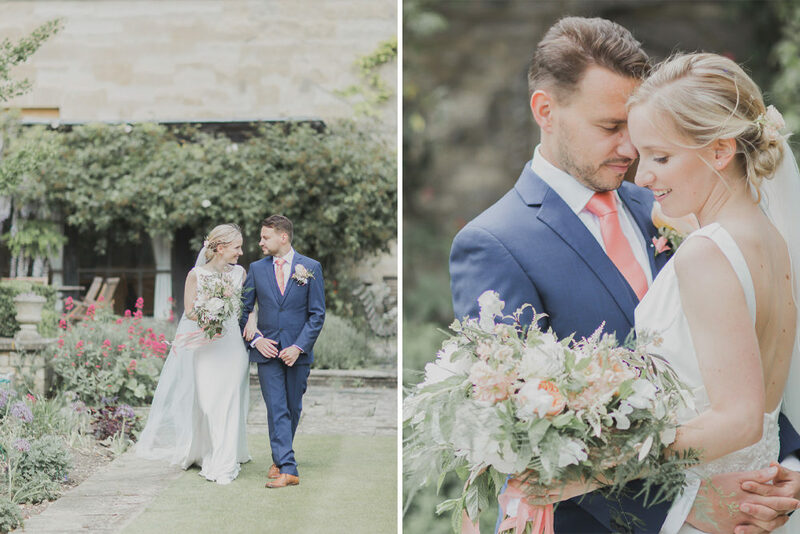 It’s hard to pick out specific moments that made the day extra special as we had the most amazing day, but the ceremony was very special and exactly how I envisioned – even the weather held out for us! James’s speech was beautiful and brought me and quite a few guests to tears. It’s just wonderful to have the person you love stand up in front of a room full of your favourite people and declare how much and why they love you. Finally we had a sparkler send-off though it was little blurry by then it was so nice to see all our friends and family wave us off at very end all with smiles on their faces – even my Granny stayed until the end with her sparkler which was the best!